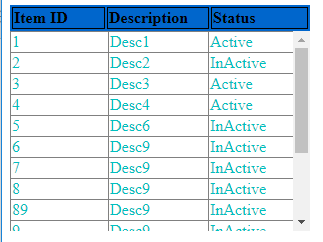 var table = $("table[id*=GridView1]"); //Pass your gridview id here. You only need to change the style of your table and girdview. Below is my code according to your link. It is better to understand that <table width="300px" style="background-color: #0066CC" > serves as header of you gridview here. So if you want to change header , you should change the style of the table. <asp:GridView ID="ItemGridView" runat="server" AutoGenerateColumns="false" Width="300"
The image shows the header row is not part of the GridView but some other bit of HTML. Use standard CSS to assign a width to the gridview columns as well as the separate HTML so the two elements are using the same format. The browser's developer tools can help you debug the UI. It seems that you want to align header and body using jquery. If so , you could try the code below. 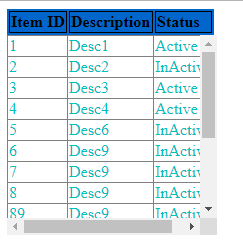 table is the id of header table. If you want to the header to move with the body, you could add the header and body in the same div. If so , you need little js.